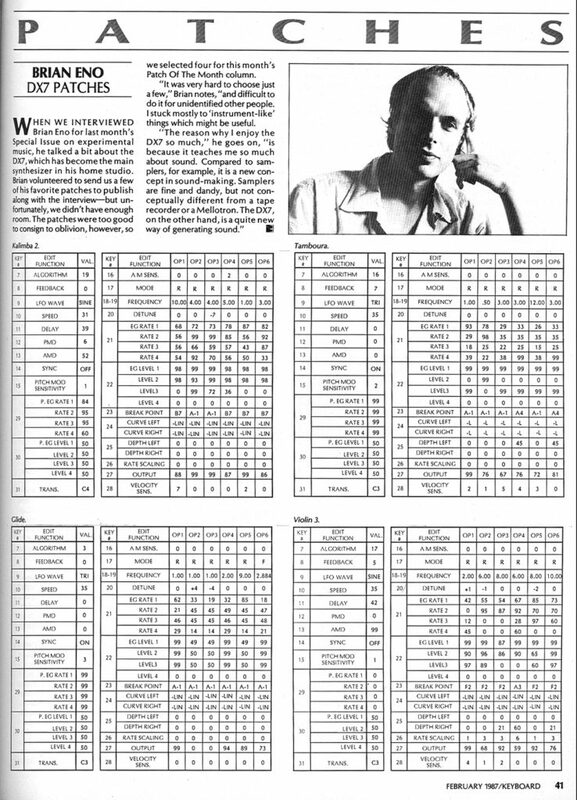 You can’t get much more 80s synth power than this: Eno. DX7. Keyboard Magazine. Yes, it seems there’s a magical synth site called Encyclotronic, full of patches and hardware specs and other goodies. And it seems that site has noted that back in 1987, Keyboard Magazine managed to extract some of his favorite patches for the Yamaha DX7 and shared them with readers. Sadly, Keyboard lacks any kind of exhaustive archive. (Believe me, having edited a book from their archives, I know – thar be dragons.) And because this was a paper publication, Mr. Eno didn’t share everything. So somewhere, he’s got even more of these. KORG, you’ve got an instrument capable of loading them. Given that you did an OK Go edition of the volca sample, surely you could do an Eno volca FM? Oh, yeah, also – Yamaha, maybe you’d consider doing something with the DX7 given you invented it? In the meanwhile, this is a beautiful, free gift to all of us. Thanks for that! Now time to get FMing.